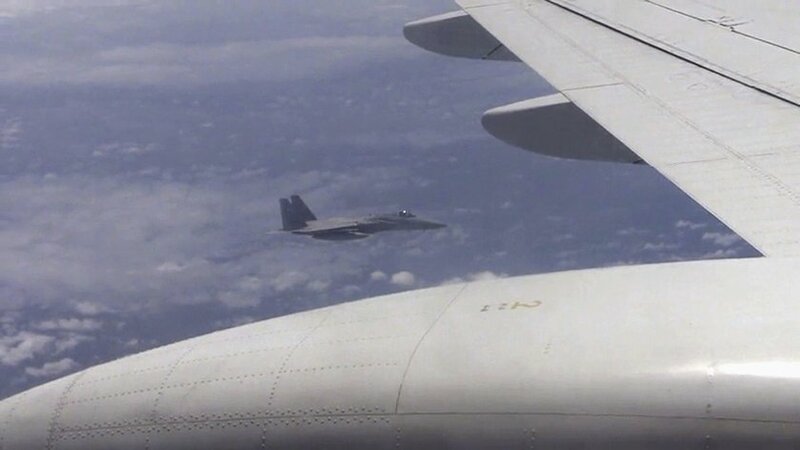 A Japanese F-15J allegedly buzzing a Chinese Tu-154 in June. Japan intercepted a record number of Russian and Chinese aircraft close to its territorial waters over the past six months. The country’s military flew 533 intercepts during the first half of fiscal year 2014, according to a Jane’s Defence Weekly report. Compared to that same period in 2013, the Japan Air Self-Defense Force (JASDF), as the Japanese air force is known, flew 308 sorties. The increasing number of intercepts is part of a growing trend. The JASDF has flown an increasing number of air intercepts since 2011. In fiscal year 2011, there were 425 intercepts, 567 in 2012 and 810 in 2013. If the trend continues, the number of intercepts could rise to Cold War-era levels. According to Jane’s, the majority of the incepted aircraft were of Russian origin—324 jets. The Russian jets were mostly surveillance aircraft—with one encounter including a Sukhoi Su-24MR reconnaissance version of the Fencer strike aircraft. By contrast, Japan also intercepted 207 Chinese aircraft—most of which were fighters. According to Jane’s, the most of the intercepts were in the Japan’s northern and southern air defense zones, which are the closet approaches for Russian and Chinese aircraft. One possible reason for the number of Russian aircraft intercepted is because Japan is installing an Raytheon AN/TPY-2 X-band phased array missile defense radar at Kyogamisaki in the Kyoto Prefecture. “The reason they come to us is to check our capabilities,” a Japanese defense official told Jane’s. The radar is used as part of the U.S. Army’s Terminal High-Altitude Area Defense (THADD) missile batteries. Japan is installing the radar to monitor North Korean ballistic missile launches.